Unless you’re one of the lucky few who’ve managed to snag a week on a tropical island during the winter, the arrival of warmer days brings mixed feelings—yep, that sun and vitamin D feel fantastic…those lily-white legs? Not so much. 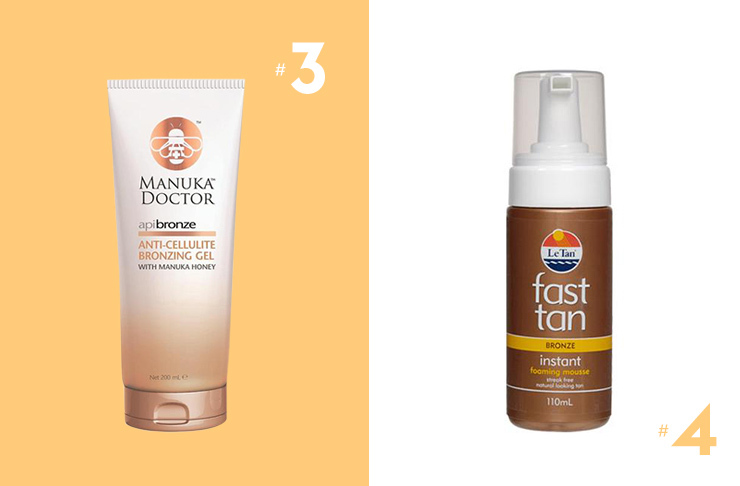 So many of us reach for a tan in a bottle, but thankfully the days where you end up looking the colour of an Oompa Loompa are over, with brand innovations meaning you can have a sun-kissed and flawless tan before you’ve set foot in the sun. 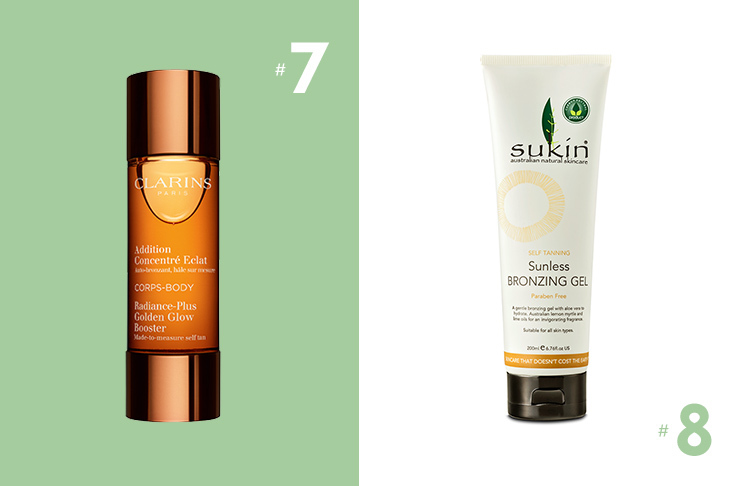 Here are our top eight tans in a bottle. There’s no point in having your body looking like a bronzed goddess if your face is still in winter mode. 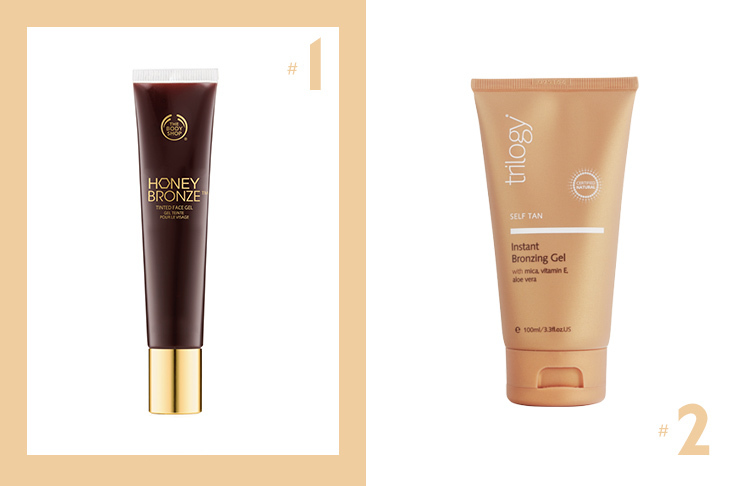 Here’s where The Body Shop’s Honey Bronze™ Tinted Face Gel steps in. Although it can seem a bit shocking because it comes out so dark, simply apply this lightweight formula beneath your moisturiser for an instant change. If you’ve forgotten about the party that you want to wear the off-the-shoulder dress to but are worried about how white you look, then Trilogy’s Instant Bronzing Gel is the way to go. Just a few hours after applying to your skin, you’ll have that golden glow, with a touch of shimmer. In true Trilogy fashion, you know you’re onto a good thing, with ingredients that are safe and natural—as well as added vitamin E and soothing aloe vera. Oh Manuka Doctor, you had us at hello. Not just a self-tanner, Manuka Doctor’s Anti-Cellulite Bronzing Gel is a multi-tasking gem you need in your life. Incredibly lightweight, and free from the (often) overwhelming scent of fake tans, this product improves the firmness of the skin which reduces the appearance of cellulite. It includes their signature Purified Bee Venom and has added Manuka honey which your skin will thank you for. It is deep brown and very thin, so you'll need to be a bit careful when handling it. Now here’s a product that proves you don’t have to break the bank to get a perfect, even and fail-safe tan. Le Tan Fast Tan Instant Mousse is an easy-to-apply foam that only requires a quick coat and a shimmy shake to dry before you’re good to go. 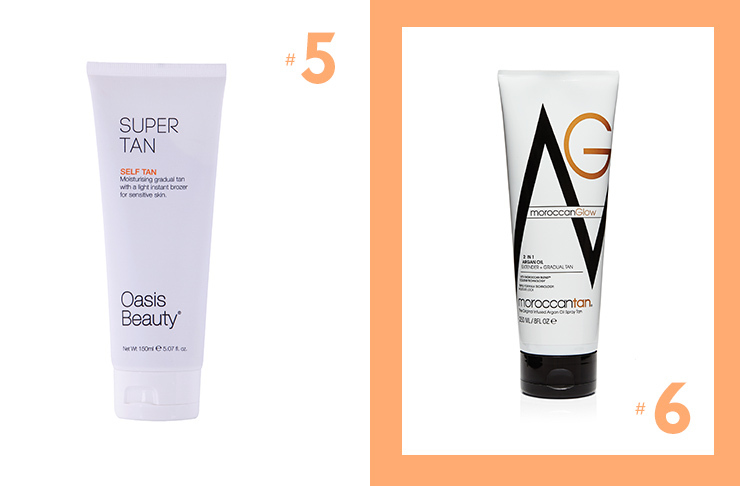 Thick and smooth, Oasis’s Super Tan glides onto your skin like a treat. 100% vegan, this is a gradual tanner that contains a light instant bronzer that helps you see where you’ve applied the cream as you go. Even better, there is very little scent and it is filled with all the stuff your skin loves—jojoba, calendula and vitamin E oils. Filled with antioxidants, moroccantan will give your body a streak-free, gorgeous tan, while also feeding it a hefty dose of vitamins A, C and E. This mousse is brown, so you know exactly where you’ve already put it. No morning-after regrets, thankfully. You’ll love the summer glow, and it doesn't look obviously fake. If time is on your side, then invest in a bottle of Clarins’ Radiance-Plus Golden Glow Booster For Body. To use, add a few drops to your normal moisturiser, mix and apply to your body. The formula interacts and stimulates colouring of your skin. This is a great option if you are nervous about streaks, or want to build up your tan slowly—you’re very much in control! If you don’t like the smell of fake tans, then Sukin’s Sunnless Bronzing Gel is for you. Incredibly gentle, this gel glides onto the skin, providing a gradual tan that’s free from parabens. This beauty is so gentle, in fact, you can use it on your face, too.